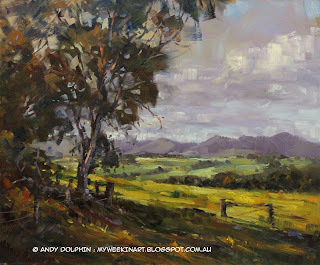 My latest plein air landscape sketch video has just been uploaded. This painting features a view across farmland to the Stirling Range, home to Bluff Knoll – the the highest peak in southern Western Australia. It was a very cloudy day but the sun did break through occasionally and light up the view. Days like this can be challenging if the sun spends too much time behind clouds but it peeped out often enough on this occasion to keep me almost sane. I actually began this painting on a board I'd previously used for a plein air painting that ultimately failed. I had only laid in the foundational wash of that painting when the sun disappeared behind heavy cloud and all semblance of light and shadow vanished with little hope of returning that day. I scraped the paint off the board and wiped it back with a paper towel. This left me with a board already stained with a warm, transparent earthy tone. Uploading this video generated an interesting copyright dilemma. If that sort of stuff fascinates you, you can read about it here. Or my second video Winter Light - plein air painting.